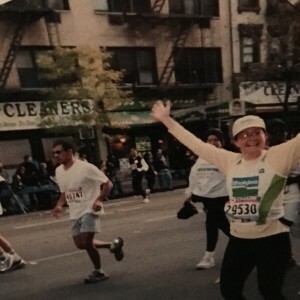 15 years ago today I ran all 26.2 miles of the New York City marathon. Sunday, November 5th 2000. 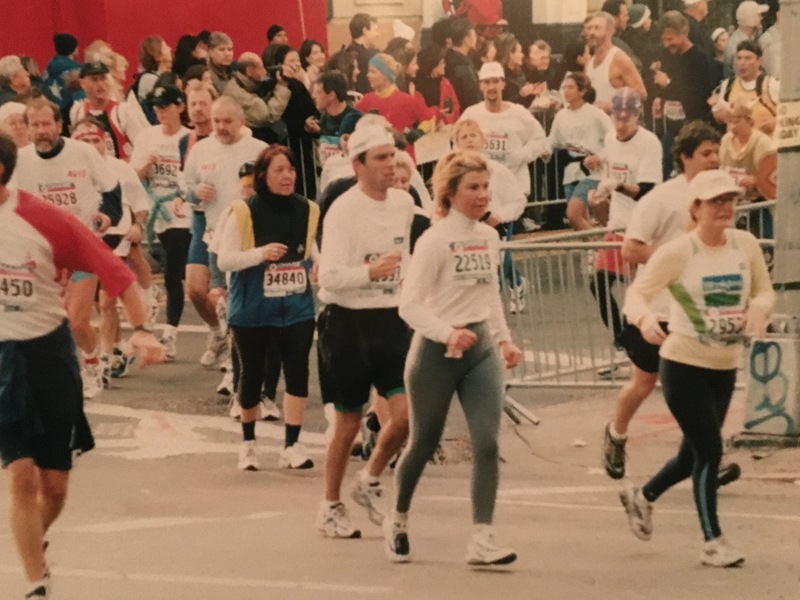 One year later, the race would be held in the shadow of the 9/11 attacks. What a different world I ran my marathon in. I don’t recall how or why I started to run. I do know that having the opportunity to house sit for an extended period of time on Manhattan’s Upper West Side in a lovely penthouse, in close proximity to Central Park, had a lot to do with the beginnings of it. With a friend’s encouragement, I began to run/walk the loop around the reservoir. When I’d barely worked my way up to a mile, he encouraged me to participate in an upcoming 5K. 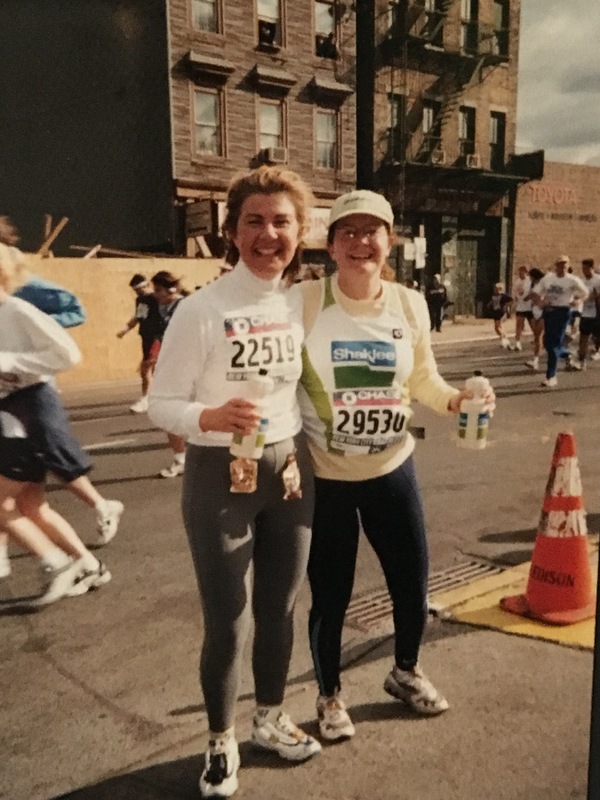 Truthfully, my primary reason for signing up for that first race was because I wanted the t-shirt emblazened with “Women Run the World” on the back. 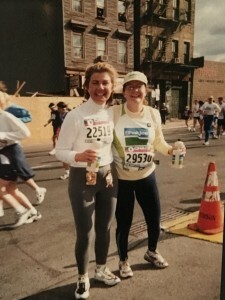 I gave myself permission to walk as much as I needed, yet to my surprise – and great pride – I ran the whole thing buoyed by the energy of the event and fellow runners. I was hooked. 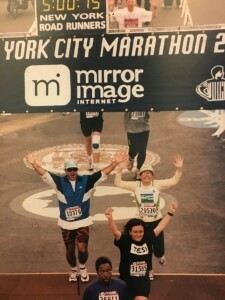 That inevitably led to being in Central Park on the first Sunday of each November to cheer on those running that year’s NYC marathon, which, in turn, planted the desire to run it myself someday. 10+ years and a move to Connecticut later, I finally committed to the training it would take to ensure I would realize my vision of crossing that finish line in Central Park. I wasn’t interested in running any other marathon. It had to be New York, not just because I’d lived there for so long, but also because the main thing I missed were my regular runs in the park. Thankfully, I also attached my goal to another one by declaring I would use it to raise money for a charity. Less than three months into training, a podiatrist diagnosed me with a toe problem called hallux limitus. He told me to forget about running any marathon. Wait, what?! I’d already begun raising money! I tearfully called my girlfriend Deb after that appointment, sobbing on the phone that I might have to give up the dream and the commitments I’d already made. If I hadn’t made those commitments so publicly, I likely would have. Soon thereafter, I shared my dilemma in front of a group at a business event. To my good fortune, someone referred me to a physical therapist who not only specialized in foot issues, but also worked with athletes. There are many benefits to working in the health & wellness industry and the network of resources is one of them. Between my dedicated PT Roberta who went above & beyond, custom orthotics and the slew of nutritional guidance I received to create a supplement protocol, I can honestly – and without exaggeration – say that the only thing that didn’t hurt after finishing was my toe! Below is my recounting of that day, 15 years ago. There are the obvious lessons I learned which correlate to both business and life. As mentioned above, declaring a goal and making it bigger than/outside myself was the beginning. I had given myself a Bigger Game, and by doing so, I was tapping into the powerful law of attraction that miraculously results. (Of course, I had no idea at the time that that is what was happening. Only in retrospect can we see how forces align for our benefit, regardless of our own, limited plan.) Following a plan, trusting the plan, HAVING a plan, the need for a timeline and a deadline, etc. All were subsequent teachings. Big, important concepts can’t really be mastered by reading, learning or talking about them. We have to DO them. Experience them. Be them. The lesson I’m most grateful for, however, right now…. today? The importance of writing about your experience while it’s fresh in your mind so you have it to look back on 15 years later. I received such an outpouring of support, calls, and emails in the days leading up to the marathon and many of you actually tracked the progress online as well. I wanted to give you all an account of what the day was like for me. I am just starting to come out of the haze that I’ve been in since last Friday. After dreaming, thinking, planning this for years, it was very strange to actually be doing it. I had to continually remind myself, “Hey, I’m finally doing the NYC marathon!” It was very weird all weekend. So, for anyone who might care, here’s what it was like. WARNING: I ran 26.2 miles so I’m feeling the right to be verbose. 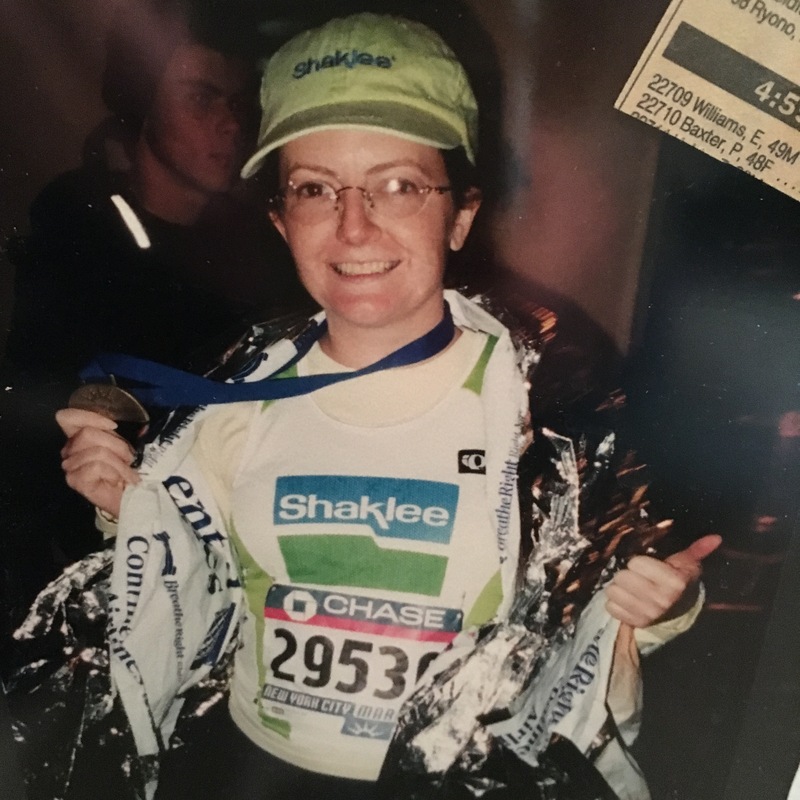 As you know, this run was in honor of the late Dr. Jim Whittam, former President & CEO of Shaklee and head researcher/scientist for Shaklee R&D. Myself and others comprising “Team Whittam” have been striving towards our goal of raising $100,000 in his name for Shaklee Cares, the national disaster relief charity. Late last week I had received an updated total, along with well wishes from Jim’s wife, Sibylle who sits on the Board of Directors for Shaklee Cares. We were up to over $56,000, horray! 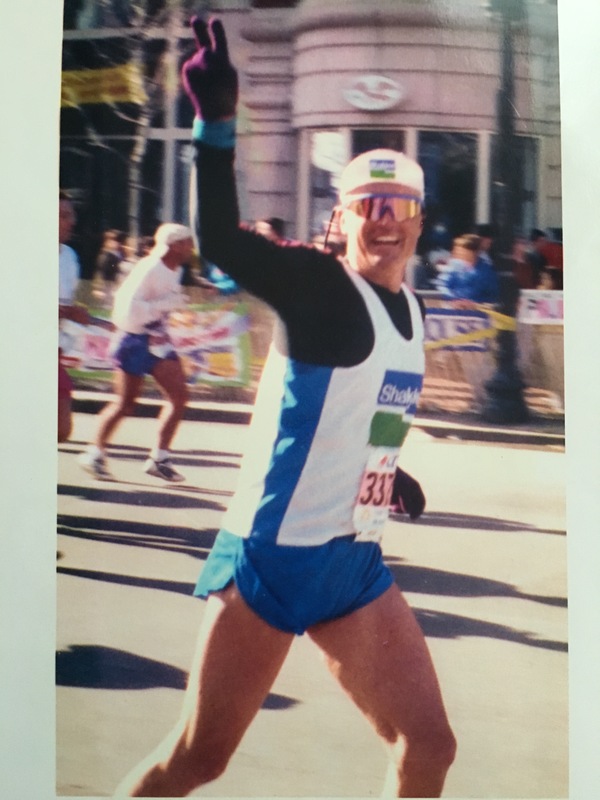 I also received from my friends Edward & Jill Lamoureux, a picture of Jim running the Boston Marathon, which I promptly posted on my fridge for last minute inspiration. 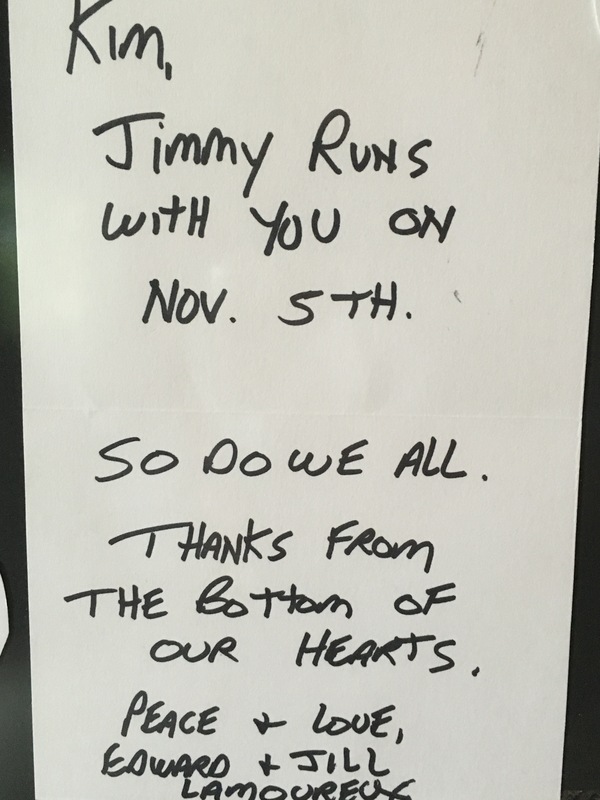 The last thing I did before I left the house on Saturday to drive to New York, was “high five” Jim’s picture for good luck. All week long I had been obsessively checking the weather forecasts for New York, which were iffy for Sunday. I kept thinking that Dr. Jim would make sure it didn’t rain, and I was happy to find that I was right. I was also glad to have the only other person in my marathon training group to be running New York – Lynn Dobrowsky, to share the excitement and anxiety with. 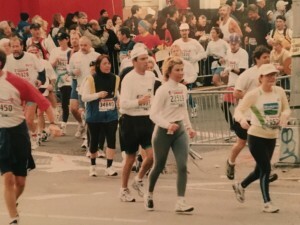 Most of our group had been training for the Hartford marathon, 3 weeks before. Lynn ended up running the whole thing, so New York would now be her third marathon. THE START: Lynn and I arrived on Staten Island at about 8am, giving us about 3 hours to wait until the start at 10:50 am. Immediately, we were grateful to have each other for companionship, as well as the warm sun and good weather. The 3 hours comprised of last minute carbo loading, trying to relax and negotiate fluid intake with the porta-potties so our bladders would be empty at the start. No small accomplishment! We slowly made our way onto the Verrazano Bridge, moving like a herd of 30,000 cows, as the national anthem was sung and the starting canon went off. Next to us was a man about to run his 13th consecutive NYC marathon. 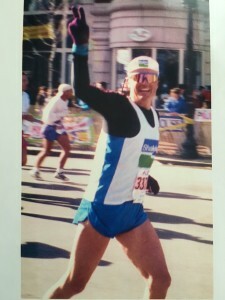 He’d run a total of 34 marathons, including the Marine Corps marathon, two weeks ago. As we began running on the bridge, we weren’t quite sure when and where we’d actually crossed the start line. FIRST 5 MILES: Crossing the Verrazano bridge was VERY windy, but beautiful. What an experience! Definitely felt Dr. Jim with me there. We were on the upper level and many runners would jump on the divider to take pictures. Gave the drivers on the express way as we came off the Verrazano a photo-op as Lynn, myself and four other women squatted by some sparse bushes and waved to them, all lined up in a row. Crowds as we came into Brooklyn were great! Actually, all through Brooklyn, people seemed to be having one big block party. Bands, cheering… we couldn’t stop smiling. MILE 6-10: At about mile 6, we found ourselves behind a guy about to be interviewed by NBC, with a camera truck driving right in front of them. We made spectacles of ourselves, both waving and yelling “Hi Mom, Hi Dad” and me yelling “Go Shaklee!”as it was broadcast live to the world. Turns out, a few friends and family living in the area saw us upstaging the poor interviewer, but it was not broadcast live in CT as it usually was. If you know anyone with connections to NBC sports, please let me know. We want to get a copy of the broadcast. After the interview was over, we ran with the guy being interviewed, and asked who he was. He and his wife had been the first, non-related successful liver transplant/donor in the country. Everyone in the marathon does have a story, that’s for sure! The first 7 miles just flew by and we reached our first Shaklee stop with Helen Fitzgerald, Carol Froelich-Hull and two others waiting to cheer us on and provide us with Performance. We quickly took pictures and confirmed the next stop before we moved on. At mile 10, as we passed a particularly raucous block of spectators and the crowds were carrying us, I commented to Lynn that this had to be the easiest run I’d ever done. BIG MISTAKE! It all went downhill from there! MILE 11-16: My legs began to make themselves known at about mile 11. Lynn, who is a faster runner than I, was still running with me. We stopped at mile 12 to use the porta-potties and the stretching I did as we waited, along with the chewable calcium, seemed to help relax my quad muscles. 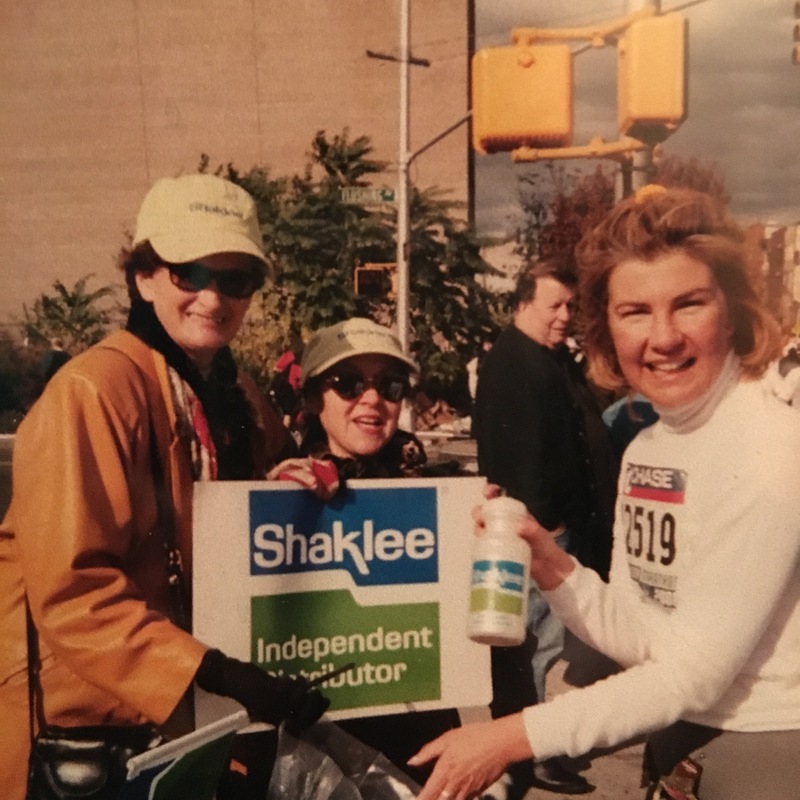 We were surprised to see Carol, our Shaklee volunteer, before we started across the bridge into Queens at mile 13, because our scheduled stop wasn’t for another mile. 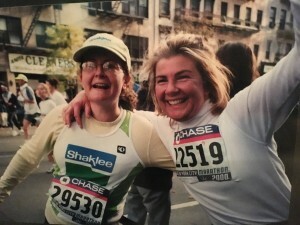 She and Helen were having a marathon of their own, trying to get from stop to stop and couldn’t get into Queens to make mile 14. 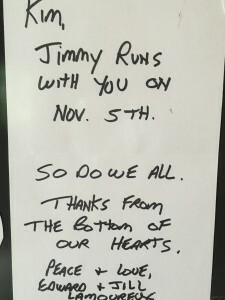 Again, Dr. Jim was watching over us, because the timing always worked out for them to catch us, just as we were coming by. I had Carol call ahead to the friends Lynn and I had waiting at mile 17, to let them know we were on our way. Cell phones are great! My left knee was starting to hurt, causing me to limp. Having never had any problems at all with my knees, this was interesting to say the least! I have a little conversation with Dr. Jim and myself, and after about 5 minutes it gets better. At mile 14, Lynn says that she now knew why you should leave more time between marathons, which explains why she was still running at my pace. We cross the Queensboro Bridge and Lynn is encouraging as she points out how strong I’m running given the fact we’re going uphill. I’m getting strength knowing I have less than a mile to go before I get to see our friends for the first time. Mile 17-19: First Avenue at last!! It isn’t as noisy at first as I imagined it would be, but gets louder as we move north. We reach our personal cheering section at 74th and First and are so excited to see them. Again, more pictures, hugs and we’re on our way. My knee flares up again, more chewable calcium, another talk with Dr. Jim, “Just get me through this…..etc.” and it is gone for good by mile 19. I momentarily freak out when there are no Shaklee people at 96th St. as planned and my Performance bottle is empty. Two more blocks and we see Carol again, my savior! Shaklee people are the most dependable people on Earth!! I’m now ready to have this race be finished and I still have more than six miles to go. Just get me to Central Park!! Mile 20 – FINISH: Lynn and I now cheer at every mile marker. I was so glad to have her still with me. I think we were both happy to have each other through these last few miles. I know they would have been even harder alone. We pass a few lone spectators as we go over the Willis Ave. Bridge into the Bronx. One tells us, “You’re going to make it, the hard part is over.” Up until he yelled that, I had been focusing on how far I had to go, rather than how far I’d already come. Our last Shaklee stop is at mile 22, and we’re lifted again as we see two people waiting, cheering, with fresh Performance bottles. I actually think they were more excited to see us than we were, telling us we didn’t even look tired. As we start up again, I mention to Lynn, that I had never met them before. Again, that’s Shaklee people for you! We had people at about 8 different stops along the way, which literally got me through the race. Do people on the sidelines really know how much they help the runners? I certainly never did until then. We enter the park at 102nd street and I am so excited to be in the park, I don’t care that I’m going uphill again. Our friends will be at mile 25 for our last and final stop before we finish. The miles now are dragging by. Finally, I see them, hand off my waist pack and yell hello to my friend and new Shaklee Director, Nina, who is on the cell phone with Deb as we run by. There’s no way we can stop. We won’t be able to start again if we do. As we near the Plaza hotel, Lynn gets her now infamous insane burst of energy. She is about 10 feet in front of me, yelling, cheering and high fiving each and every spectator who has their hand out. Still, she looks back for me, screaming “Less than a mile to go, let’s go!” On Central Park South, the crowds are enormous, still cheering like you’re the first runners they’ve seen all day. Even though I’ve been eager to stop since mile 19, I can’t believe it’s almost over. We turn back into the park, less than ½ mile to go and this is the part of the race I’ve done a thousand times in my head. But now it’s real! I see the finish line ahead, cheering spectators in the stands on both sides, Sinatra’s “New York, New York” is playing and I have to fight back the emotion so I can finish. I would like to let go and give into it, enjoy it, but I won’t be able to breath and finish if I do. I surge ahead and hear Lynn yelling, “Go Kim, Go!” as I push up the last hill to the finish line. Once across, I can finally let the emotion come, and it does, but I’m not the sobbing mess I thought I’d be. I’m too tired. My body hurts. I did it, just like I knew I could. My net time is 4:54:12 (11.23 avg pace). Not what I was hoping for, but at least I finished! AFTERMATH: 26.2 miles really is a long way to run. Though cliché, it was the experience of a lifetime. As my friend Pam (3-time NYC marathoner) says, “Welcome to our club” – people who understand exactly what it means to run a marathon. I’ve learned to never say never, but I don’t think I’ll need to do it again. My new running goals will focus on ½ marathons and improving my speed. For now, I’m trying to go up and down as few stairs as possible, while I allow myself some much earned rest. After all, the saying goes, the pain is temporary…. the pride lasts forever!